Lakeville, Conn. - Holiday traffic was heavy today at Lime Rock Park in the fourth round of the American Le Mans Series, with hard contact and close calls the order of the day in the New England Grand Prix. Corvette Racing's bid for a record 13th consecutive victory in the GT1 class came up just short in a photo finish between the No. 3 Compuware Corvette C6.R and the No. 009 Aston Martin DBR9. Aston Martin driver Pedro Lamy edged Corvette star Johnny O'Connell by .033-second at the stripe. It was the first race since March 2005 that Corvette Racing had to settle for the second spot on the podium. "He had me by two feet, but with another lap or two we might have got him," said O'Connell. "The guys on the No. 3 Corvette crew have been working so hard and I really wanted to get them a win. This is a very busy race track, but it was a fun battle and we raced each other clean." "It was crazy out there - as crazy as I've ever seen it," said O'Connell's teammate Ron Fellows, who drove the first one-hour, 41-minute stint. "That's typical of Lime Rock. I was a tick quicker than the Aston in a couple of areas, but not quick enough to take a shot at him." The two-hour, 45-minute race on the roller coaster 1.54-mile circuit was punctuated by frequent contact and three full-course caution periods. The first incident was the result of Dyson Racing's LMP1 prototype making an optimistic passing attempt in Turn 3 on Olivier Beretta in the No. 4 Compuware Corvette C6.R. The prototype pushed the Corvette off the track, and both cars ended up in the guardrail, mired in mud. "The car was flying and I was pushing hard to catch the leaders," Beretta reported. "I was trying to do my job and an accident happened. I turned into the corner and straight away I felt a car there. He touched me and I went off on the grass. My main concern was the steering. The crew did a terrific job as usual to get the car back on the track." "The crew had to change the nose, change the engine undertray, and replace a broken tie rod end," reported team manager Gary Pratt. "We cleaned off the mud, changed the tires, and the car was back going again." "We've had some luck for the last eight races, and it ran out today," said Gavin. "It was just not our day. I was impressed with how the boys got the car back out there. We completed the required 70 percent of the laps, earned some points, and now it's on to the next race." The race for the GT1 title was another pitched battle between the Aston Martin and Corvette camps, with the three frontrunners locked in combat on the same lap for the entire race. 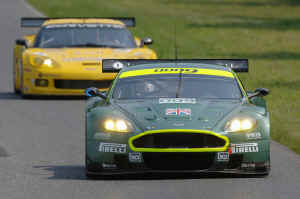 Fellows took the lead on the start, passing pole sitter Darren Turner's Aston Martin. At the 10-minute mark, Beretta and Aston Martin driver Stephane Sarrazin made contact in Turn 1 and both spun. After one hour and 19 minutes of flat-out racing, Fellows and Sarrazin swept past Turner on the inside of Turn 1. Following the final round of pit stops and driver changes, O'Connell took second place from Tomas Enge with eight minutes remaining, and narrowed Lamy's margin from 3.7 seconds to a fender length at the finish. The Corvettes were carrying 199 more pounds than the Aston Martins, running smaller intake restrictors, and using smaller fuel tanks as a result of "balance of performance" adjustments mandated by the sanctioning body. "At some point in time we knew that the 200 pounds and the restrictor would be too much to overcome, and today turned out to be that day," said Corvette Racing program manager Doug Fehan. "It was certainly one hell of a battle, and it's a good thing for Aston Martin that the race wasn't about four feet longer. I think the fans got their money's worth today." Corvette Racing's next event is the inaugural Utah Grand Prix at Miller Motorsports Park near Salt Lake City on July 13-15. The fifth round of the 10-race American Le Mans Series will be televised tape-delayed by CBS Sports on Sunday, July 15, starting at 2 p.m. EDT.